1. Lay the halved peaches onto an oven tray and spoon a little orange juice over each, then drizzle with half the honey. 2. Grill for 5 minutes until slightly caramelised and soft. 3. Heat a large frying pan over a medium heat. Add the oatmeal and sugar and stir until the sugar has melted and the oatmeal is golden. 4. Tip the oats on to a baking sheet lined with grease proof paper and cool. 5. 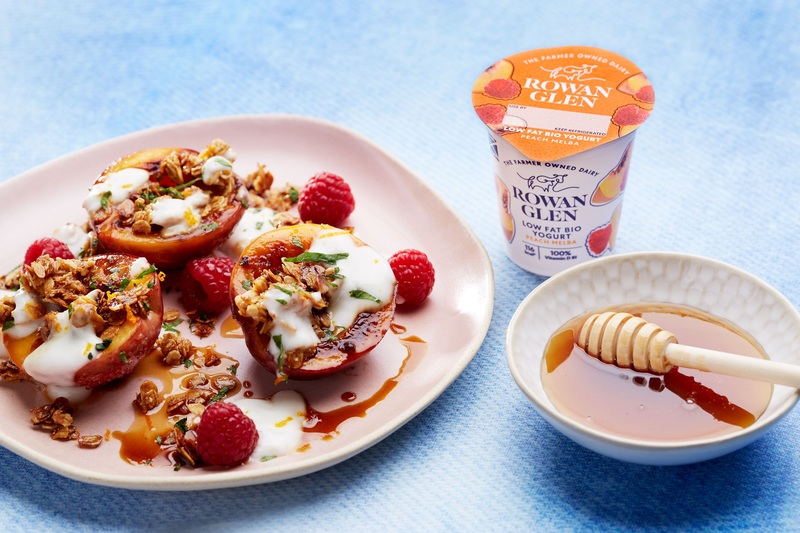 Arrange the peaches onto plates, sprinkle with toasted oats, drizzle with Rowan Glen Peach Melba yogurt and remaining honey. Scatter with raspberries and chopped fresh mint before serving.